Sunday night ended a few weeks of “high-level” international basketball that saw a USA team blow through 9 games and finish in fashion with a 37 point win over Serbia. The surprise of the tournament came in the quarterfinals when host Spain lost to France. However, in retrospect, it’s tough to decide what was a bigger surprise in the end; USA dominating with essentially a 3rd string team or Spain not making it through with their best group (a group that has been together for a couple Olympic cycles. This is the first team in the history of international basketball to win 4 major titles in a row and did so with the 3rd largest average margin of victory. But did anyone watch it? And who played? You could make the argument that not everyone on The Dream Team was an all-world talent. But let’s remember that at the time Christian Laettner was one of the best (if not the best) players in college basketball. And it was to become the way of the national team to offer a spot for the most promising college player onto the team of stars. It happened with Anthony Davis when the USA won gold in the last Summer Olympics. But Mason Plumlee? He’s been in the NBA for a year or two now and he’s far from promising. If we are taking a look at the roster, it’s not quite what most expected after the first couple versions that USA Basketball has thrown together since attempting to become more of an entity 12 months of the year, rather than a team that plays together for 2 weeks and goes on its way. I’m talking mainly about players like DeMarcus Cousins, DeMar DeRozan, and Rudy Gay. Yeah, there’s plenty of other better players missing that easily could have been situational, need-based, specific-talent players that could come off the bench and do one thing so amazingly that they didn’t need to do anything else (a la Kobe Bryant as a defensive stopper for the last Olympic team). But this wasn’t just a Team USA problem. Usual suspects like Germany and Canada were missing. Germany always seemed to sort of be interesting with Dirk Nowitzki and adopted German Chris Kaman, along with old UNC baller Ademola Okulaja and other randoms. Though they never had much of a breakthrough, it was a necessity for such a large nation to be in a competition of this magnitude. Canada was always intriguing as long as Steve Nash was going to show. And now that he’s not in his prime (actually, he’s like 4 years past his prime) there’s new talent like Andrew Wiggins, Tristan Thompson, Nik Stauskas, Tyler Ennis, Corey Joseph, and Anthony Bennett who aren’t even on the regular senior national roster. Unfortunately, the parity that made fans of USA basketball want to watch have since gotten older and less interested in playing for their countries assuming they aren’t out of basketball altogether. While most casual American fans want to see teams play their team close, they really want to see the best teams these countries have ever assembled get completely destroyed by the stars and stripes. Argentina used to be a world power and now is basically just a couple has-been NBA’ers and a bunch of no-name youngins. Brazil had three legitimate big men, one aging freshly-signed NBA journeyman, and a few national team retreads that are best suited for European ball. France was missing Tony Parker and Joakim Noah among others and still was dubbed one of the “star-studded” rosters. Spain was even sort of a letdown. 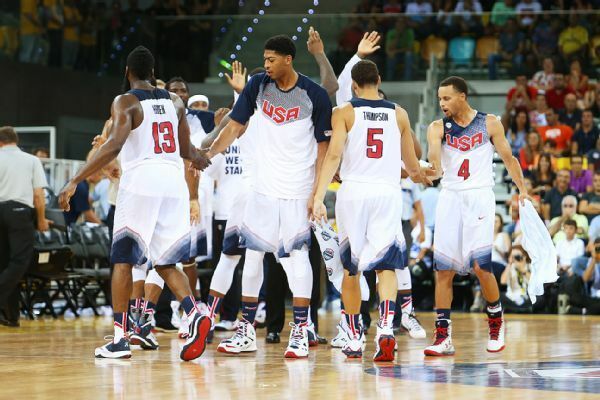 We’ve seen all they have to offer and the only thing that makes the next Olympic cycle set for Rio in 2016 sort of interesting is that Team USA won’t have to play until exhibition season for that event, giving time for some actual build-up for us to want to see them play again.